A few weeks ago, I tried an apple-fennel sauerkraut at a farmers market in Oakland. 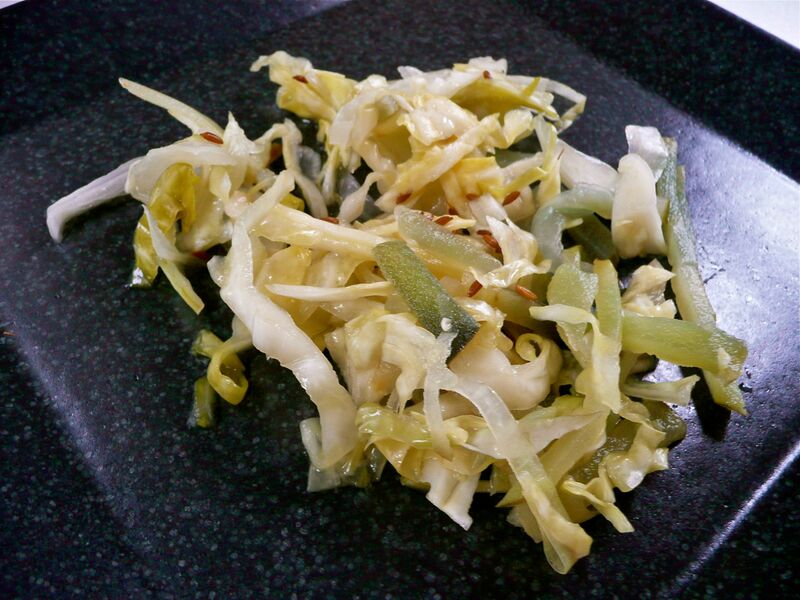 It was fresh and tasty, with whole fennel seeds mixed into the shredded cabbage and sliced apple. It inspired me to make my own, but to shape it according to my own taste. I felt like the apple stood out too much in the kraut from the market. The pieces were big, cut differently from the green cabbage. Also, while the fennel seed was nice, I wanted to see what the recipe would taste like with slices of fennel bulb fermented along with the other ingredients. And while fennel seeds are tasty, I’ve been wanting to put caraway seeds in my sauerkraut for a while. I have a slight addiction to caraway seeds, the kind that happens when you grow up in New York thinking that the term “rye bread” is always preceded by the term “heavily-seeded,” if you want the good stuff. Hence, this recipe. It’s worked out well. It’s been fermenting for a week and a half now, almost two weeks, and getting better every day. Try it out, and make your own variations. Enjoy! filtered water (Brita or store-bought). The water must be filtered, because chlorine can interfere with the fermentation process. 1. Chop up green cabbage into very fine pieces, removing any of the white core part. Chop up onion or sweet onion into thin strips. 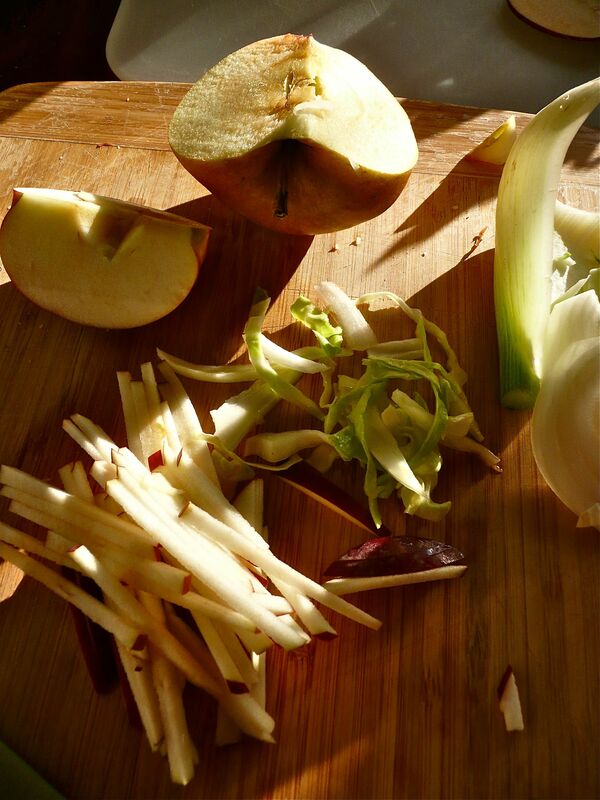 Chop apple into thin strips mirroring the size of the cabbage and onion strips. Chop the fennel into thin strips, discarding the core and using only a little of the green part if it’s tender. Set aside a handful of caraway seeds, some kosher salt, and some filtered water. 2. Put the cabbage shreds in the crock first. Take a few tablespoon-sized pinches of kosher salt. Mix it into the cabbage, coating the pieces. Press down on the cabbage as you do this, to encourage the cabbage to start sweating. Then mix in the other vegetables and as much of the caraway seeds as you want to use (the favor goes pretty far). 3. Now, some people never add any water to their sauerkraut, because they magically get the cabbage to sweat enough liquid to cover the whole thing, which is the goal; you don’t want air touching the vegetables. But I’ve found at least some filtered water is necessary. Still, I give it a little time before I add the water, maybe a few hours. 4. To compress the kraut and help it sweat, take that small plate that fits inside your crock and put it on top of the cabbage mixture, pressing down. To hold it down, take that big jar and fill it with water to make it heavy. You can put a lid on in case it spills. Then drape your cheesecloth over the whole thing to keep bugs out. 5. Check it after a few hours. If the cabbage hasn’t released enough liquid to cover the mixture fully, go ahead and add some filtered water until it is covered. 6. The next morning, taste the water. Does it taste at all briney or does it just taste like water? If it just tastes like water, go ahead and toss in some more kosher salt. 7. Check the kraut every day. If a little white mold grows toward the top (I find this is less an issue with kraut than it is with pickles), skim that off. 8. The kraut should start being good after five days, get really good after a week, and get excellent in the 1.5-2.5 week range. Wherever you like it, at whatever stage of fermentation, put it in the refrigerator to slow down fermentation. Picture is my mother’s turkey last year. It’s a very small one, and she uses fewer vegetables than I do. I haven’t posted in a while, but I was just writing out the family turkey recipe for someone and thought I’d share it with you all too. If you’re looking for a delicious recipe that keeps the turkey moist and uses a lot of local vegetables, this is a great one. Down below the recipe, you’ll find some options for stuffing and a fairly ridiculous story related to this turkey recipe. This recipe is for a large turkey. Use a bit fewer vegetables for a smaller bird. Optional vegetables — Fennel and leeks are particularly nice. Potatoes are good too, although the starch will thicken the sauce a little. Some people like that, but I prefer it liquidy. Rice for the side — I like making both wild rice and regular white/brown rice. I cook my wild rice with sautéed onions and broth. Stuffing — See options below or make your own. Prepare your stuffing (see below). Prepare your bird: My mother washes it, but I don’t; the thing is going to be roasting in a hot oven for a few eons, and washing it means you then have to wash your sink. Check for pin feathers and remove any. Take some tarragon leaves and some thin squares of butter, if you’re using it, and slide them under the skin of the whole bird. To do this, lift the skin gently at the turkey’s opening and coax the butter and tarragon up and over the breast and thighs. If you aren’t using butter, coax the tarragon up anyway and try to get a little olive oil but over and under the skin. Drizzle lemon juice all over the bird and in the cavity. You can even slice a bit of the lemon rind and tuck it under the skin, although that really changes the flavor. Then fill the bird with stuffing and tie it closed, using cooking twine and a needle to sew the cavity closed or just get creative wrapping the thing with twine. I recommend sewing closed if you can. Finally, coat the bird with olive oil, rub it in, and sprinkle with salt. Dampen your cheesecloth with water and then coat it with olive oil, and drape the bird with cheesecloth. The turkey starts at 450 degrees for the first half hour, then is lowered to 375 for the remainder of cooking time, which is 15 minutes per pound (add a little more if it’s a stuffed bird). The turkey should roast on its side, one wing up at a time. For the first hour (450 for 30 minutes, 375 for 30 min), you want to rotate every 15 minutes. After that, rotate every half hour. When you rotate, make sure the cheesecloth is keeping it moist; readjust the cheese cloth and pour on more olive oil as needed. If there are drippings, you can spoon those back up over the turkey to baste it when you rotate; this will get easier during the vegetable portion. When I make this recipe with a chicken, it rests on vegetables the whole time. 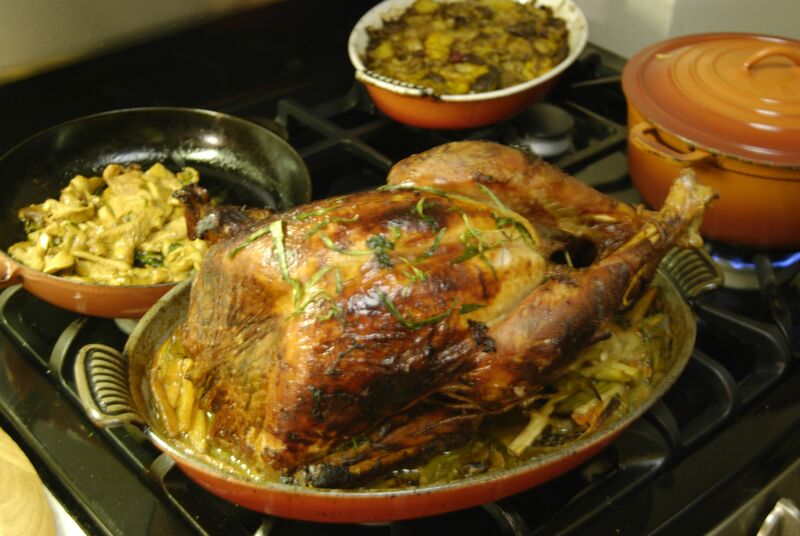 With a turkey, it rests on vegetables only the last hour and a half. So, calculate when that will be, and start chopping your vegetables within the hour before predicted veg time. You want your vegetables sliced thin. This is one of those few recipes where the vegetables should end up soft in the sauce so they’ve absorbed as much turkey and wine flavor as possible, and the sauce is, well, sauce-like. So, cut very thin carrot and celery sticks about 3-4 inches long, thin strips of onion, and thin strips of fennel and leek if you’re using them. Do not use the mushrooms yet. At t-minus* 1.75 hours, start pre-cooking your vegetables in olive oil in a heavy pot on the stove, with all of the sage and about half the tarragon. Add salt. At t-minus 1.5 hours, take the bird out of the oven, lift it from the roasting pan, and make a bed for it out of all the vegetables, stirring them well into whatever drippings are down there. If whatever’s down there is browned onto the pan, use a dash of wine to deglaze it, and coat the vegetables with that. Place the turkey back on the vegetables, with all the wing-up rotations and oily-cheeseclth-testing done, and continue roasting, rotating every half hour. These times, stir the vegetables every time you rotate the bird wing-to-wing. *Rumor has it that the phrase “t-minus” comes originally from the amount of time left until a turkey is done roasting. While this rumor has yet to be verified by any kind of trustworthy source like, er, the Internet, I think I’ll just go ahead and start telling all my friends this. Slice the mushrooms thin in time for t-minus 30 minutes. If you’re using some wild mushrooms, cut them in larger chunks. Stir them into the other vegetables and place the turkey breast up for the last half hour of roasting. The theory here is that by placing it wing/leg up for most of the time, you’re getting the fat from those meats dripping down into the breast and keeping it moist/preventing it from drying out, but for the last half hour, now that it’s been nicely saturated, you want to get that skin nice and brown. This is a good time to start cooking your rice too. Make sure the turkey is done by stabbing a thick joint between the leg and body to check if the juices run clear. The whole turkey should be golden brown. Put some fresh tarragon on it. Let the turkey rest 10-15 minutes at least before carving. Most people wait longer, given the arrival of guests and frantic finishing of other dishes. But do take it out of the vegetables right away, because you want to make those into your sauce. To do so, pour wine directly into the vegetables. You can use white or red or a mixture. I prefer white for chicken, and a mixture of white and red for turkey. Red is good in this sauce, but it becomes a little strong with just red. I never measure the wine, honestly, I just keep tasting it until it tastes like my mother’s. But I’m guessing for turkey, and for this quantity of vegetables, it would be at least a few cups. Also, stir in all your remaining fresh tarragon leaves. This sauce is delicious on rice or mashed potatoes or just eaten by the spoonful. My mother just chops tiny pieces of onion, carrot, and celery, and sautés them with tarragon and sage and chopped Italian parsley, then uses that as a stuffing. I start with that idea, but I add to it: some cooked brown rice and/or wild rice, maybe some gluten-free croutons (which someone was selling at the U-District market last Saturday), a handful of cranberries. Do whatever you like, but the sautéed onions, tarragon, and parsley should definitely be included. Stuffing isn’t a thing of measurements; just mix up whatever looks good to you. The story gets saved for last. It’s a bit awkward, since it deals with my mother’s slight discomfort at the time with lesbians getting pregnant and having children — my mother is now very open-minded — but it’s hilarious and worth sharing, if you’re into awkward food stories about reproduction and mothers getting over their homophobia. So, about ten years ago, my college best friend was ready to have a child (now my nearly-nine-year-old wonderful nephew). She had her child through a donor. This involved long, complicated processes of finding a good company in California, choosing a donor, and receiving a delivery kept cold on dry ice to rural Michigan, where she lived. (Not that there is any shortage of cold already in Michigan in the winter.) It also involved careful instructions for helping increase the odds of fertilization — not just the obvious things about timing around ovulation, but directions on what position to lie in afterwards and such. That’s the thing: the old myth of instructions to use a turkey baster is false, but there are some other parallels with turkey. Specifically, as my friend described to me, she was instructed to spend several hours lying still, rotating from side to side. Fifteen minutes on each side, and then rotate every half hour or so, one hip up and then another. Then lie face up for a little bit. So I called up my mother. “I have to tell you a story,” I said. “I know you’re a little weirded out by the whole way D is getting pregnant, and that’s unfamiliar to you. But I think you’ll appreciate this if you can get past the discomfort.” I told her about the directions. “What does that sound like?” I asked her. My mother paused. “That’s my turkey recipe,” she said, faintly. And laughed. Fast forward nine months. I flew out to Michigan to be a birth partner to my friend, along with another dear friend of ours. It would be us and three (count ’em, three) midwives supporting a home birth in her house in the woods. I flew out a few weeks early, just in case. Besides, at eight and a half months pregnant, my friend was in charge of a Thanksgiving dinner for several dozen people. I didn’t want to worry about her getting exhausted hauling giant pots all over the kitchen, and promised to take on the turkey and as much of the rest of the cooking as she wanted. Of course, I brought my mother’s turkey recipe. The Thanksgiving went off smoothly, and she even forgave me for being neurotic about the cutting of carrots (she was cutting large chunks, because she wanted them to be hard). After smelling the turkey cooking all day, and with the rather-increased appetite of being close to full term with a pregnancy, my dear vegetarian friend caved and devoured turkey. And ate it for leftovers. For days. Today, I consider her son my nephew, and he is one of my favorite people in the world. He’s turning nine a week and a half after Thanksgiving. My mother is past her homophobia; she calls me up and rants about Republicans and their weird ideas about controlling marriage. My friend isn’t remotely vegetarian, and she makes my mother’s turkey recipe when she makes turkey, although she still cuts the carrots too big. She’s also an amazing mother, and lives much closer to me now. And every Thanksgiving, I’m grateful for all of them, and for a good story.